Product Dimensions (L x W x H): 25" x 5" x 32"
Our Enterprise Yacht model is scratched built plank on frame by skillful and creative master craftsmen. Strip by strip of mahogany and teak were put together. It was built according to scale through original plans, pictures and drawings. The hull is truly beautiful; It was carefully put together using the best material to create a smooth surface on both sides. 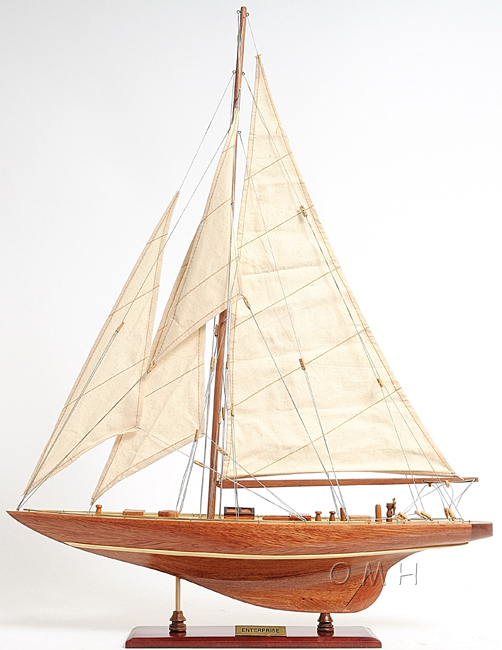 On the yacht, you can easily locate gorgeous wooden parts and ornaments such as: wooden mast, wooden boom, wooden bunkers, front and main sails with detailed stitching, wooden pole and metal steering, metal railing, and many more. 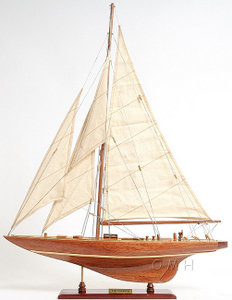 We only use high quality wood and metal to build the model, absolutely no plastic parts. This beautiful model is rested on a painted solid wooden stand. To enhanced value and recognition, a shiny metal plate embedded with Enterprise 1930 is provided. The masts are fold flat down for shipping purpose. Assembly in minutes. Responded to Sir Thomas Lipton's challenger Shamrock V, four syndicates of Americans commissioned, at great cost, their own contenders. Starling Burgess led the effort for one of the New York syndicates. He promptly engaged the Wizard of Bristol, Nat Herreshoff, dean of American yacht designing, as his adviser. Together, they designed the largest and fastest racing machine ever seen and named her the Enterprise. This great and gorgeous J-boat was eighty feet long at the water line and sported a heavy keel with two centerboards. Her great 162-foot mast tapered from one and one-half feet at the base to nine inches at the top. It was made of two hollow tubes of aluminum and was supported by a large array of stays and rigging. Below deck she had two dozen winches for handling lines. Enterprise made short work of the other three would-be defenders of the Cup and was chosen to take on Shamrock V off Newport, Rhode Island. There, in September 1930, she went on to win a clean sweep of four races, maintaining the 80 year record of uninterrupted possession of Americas Cup.